According to the experts, decorating with colour is all about intuition, imagination – and some knowledge of colour theory. The colour palette is not just about paint, it includes the colours of the floor, furniture and fabrics, window coverings, wallpaper and accessories. The first step in putting together a colour palette is to look at the base elements of the room that can’t be altered. This includes the colour of the flooring, architectural features such as aluminium window joinery, fireplace surrounds, exposed brickwork as well as any other permanent fixtures. If they’re part of the room, they’ll need to tie in with your new colour scheme. Next, think about the decorative pieces that will be taking centre stage in the room – artworks, patterned fabrics, decorative rugs, collections of objects from your travels – all the items that you love looking at every day. You can draw inspiration for colour and mood from these items. Wall colour is a backdrop to everything else that’s going on, whether it’s the furniture, the art, or the view. These are the focal points; it’s all about what you want people to see when they walk in the door. You want your paint colours to accentuate all the other items that you have. When pulling a colour palette together, a basic understanding of colour theory can help. On one side of the colour wheel, we find warm colours: yellows, oranges and reds. The opposite is the blue-based cool colours, which include blue, purple and blue-greens. To create a harmoniously coordinated palette, choose colours that sit beside each other on the colour wheel, such as the rich red, orange and yellow that feature in this sitting room. If you’re more adventurous and want to add vibrancy with pops of colour, choose a complementary scheme, i.e. pick colours that sit opposite each other on the colour wheel, such as the blues and yellows. 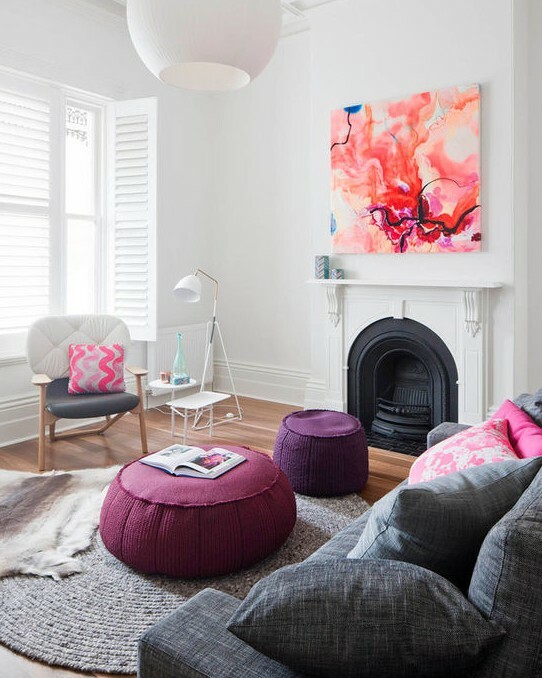 Once you’ve selected the bolder colours you’d like to use in your home, anchor them together with neutrals that have a subtle undertone of the same colour and colour temperature. While there’s no magic number or formula for creating the ideal colour palette three to five colours will produce a good result. It’s not always about the number of colours used, but the way they’re all tied together. When it comes to making colour work, the division of labour is important. The general rule is 60/40. You have one main colour, which is usually your neutral, and this is applied to 60 percent of the space. Then you do another 20 percent in a contrasting or complementary colour, and then break it down to make up the different proportions, roughly 10 percent each in accents.